Use polymer clay to make these cute rainbow pens with graphic cuteness! 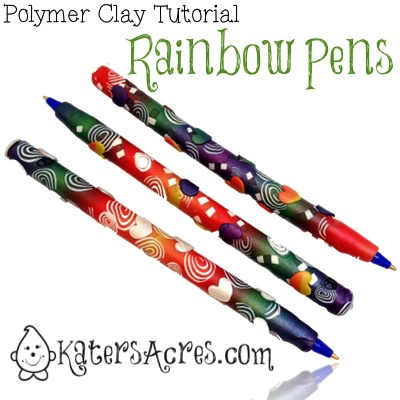 Making polymer clay rainbow pens are a fun afternoon project. I love making pens to give as gifts or to make as fillers on my table at shows and events. ENJOY! A basic polymer clay rainbow skinner blend, rolled out on a mid-setting on your pasta machine. Bic pen with the pen’s ink well removed (just grab & pull with a pair of pliers. Oven to bake your project. What is a Skinner Blend? A Skinner blend is a way of combining two colors to create a variegated palette that is unique, blended, and can be seamless with enough patience and effort. The old term for this used to be a gradation … today people sometimes refer to it as an “ombre” effect. This effect can be achieve with similar colors (as show below) or with opposing colors to create new & unusual blends. Sculpey has a fantastic post with more information on Skinner blends, including how to make one using the “traditional techniques” with triangles formed into squares & rectangles. You can make your rainbow skinner blend using the technique’s in Sculpey’s tutorial. NOTE: I have used the Teardrop Method (CLICK the link above to watch a demonstration on YouTube by Cindy Leitz). To create your skinner blend, form teardrops of clay from left to right using purple, blue, green, red, & yellow. Each teardrop should be approximately the same size. Always keep your colors lined up (yellow on yellow, purple on purple, etc)! If you turn your blend, you WILL ruin it. NOTE: I wanted to control the size of my blend, so I used my pasta machine wedge to make the blend less wide. (Get the tutorial here) By using the wedge, I control the size of the blend so I can turn the blend into a block much easier. NOTE: The more your roll the blend through your pasta machine, the more gradated the color palette will be. I only rolled mine about 25 times. When you are finished (you decide how gradated you want your blend to be) you should have a LONG strip of clay. Now use this blend to cover your pen with clay. To finish your pen, simply follow the tutorial below. When your pen is covered add translucent canes of your choice: spiral canes, flowers, petals, or heart cut outs. You do NOT have to have a skinner blend to make this pen, this is just what I used. You do NOT need a polyclay blade, you can use just an exacto knife, or even a kitchen knife or plastic knife*. Be sure to follow the manufacturers instructions on the package for baking. I used Premo! polymer clay and baked my pens for 40 minutes at 275 degrees and tented them with foil to keep them from burning. Wonderful! Have fun making the pen and using it!